1.Please introduce your current venture and your job. Can you tell us the reason why you chose this job? First of all, thank you for this interview. We appreciate the interest we are receiving in our platform and business. and started building the platform and bringing awareness to the community about airdrops & candy. 2.When did you get to know blockchain and when were you engaged in blockchain? Please share your experience with us. I have a wide and "long" experience in Blockchain. 3.Can you tell us what are your strategic and business plans? best way to introduce new people to this awesome technology. So our strategy is to welcome people into crypto and grow this space, and if they space grows so do we. 4.What do you think the future of ICO? According to third party data, the number of contracts, created by Ethereum hit a several-month low. ICO is less and less. How would it affect AirdropAlert? attract investors. I think this is great for the long term growth of crypto. Back in 2017 we saw many projects, without any fundamentals, raise a lot of money. This was a scary situation and was not sustainable. had a new release at the time of the airdrop. They conducted a successful ICO in 2017 and raised over 40 Million USD and did an airdrop in 2018 to attract users to their app. That will be the shift in airdrops we will see moving forward. 5.Crypto airdrop happens every day, however, some people believe that only few cryptocurrencies can survive and most of them will eventually die out. May I have your opinion about it? We agree with that. 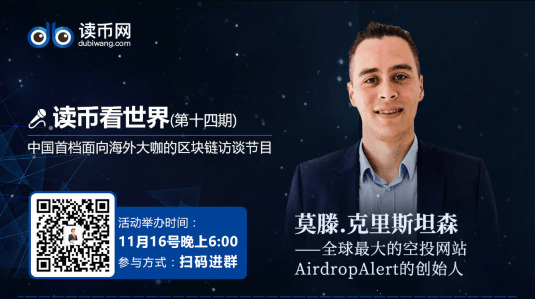 That's why we assembled a due diligence team (https://blogs.airdropalert.com/safe-crypto-airdrop/) to inspect each airdrop out there. Our team reviews all the project and we publish the ones we find legitimate and with a decent chance of succeeding. This way we can avoid our users joining hundreds of worthless airdrops. 6.It is reported that the number of Ethereum dApp user is not as many as expected. How to attract as many users as possible in your opinions, for those blockchain startups, which are dedicated to developing blockchain technology? How to make the best use of crypto airdrop for blockchain startups? attract users. The better your product is, the higher your conversions will be. 7.Compared with other website, what are the advantages of AirdropAlert? Our biggest advantage is our user dashboard. Users can log in and have an easy airdrop experience when joining airdrops. We have other functions available, like storing your ETH wallet in your profile which allows you to see your ETH and token balance in 1 click. So it is extremely easy to track if you received airdrops or not. Furthermore, as the first airdrop website we have the most experience researching airdrops. We try to find the quality airdrops out there to present to our users. We are a great platform for airdrop beginners, with our beginner guides on wallets, exchanges , crypto usage and customer support. 8.Blockchain is facing regulation globally now, may I have your opinion about this? Can you briefly introduce the regulation policy in Netherlands? How does the regulation in Netherlands affect your business? I believe regulation is the key to mass adaption. So we are embracing regulations and preparing for them, by implementing KYC and verifying clients we work with. In general, the Dutch government is very open to discuss issues with entrepreneurs who want to prepare for future regulations. It is kind of silly, but we struggled opening a corporate bank account because we are a blockchain start up. Even though we are not raising any funds. We are merely a platform for exposure of blockchain projects. Still it took us many tries at different banks to open an account. If the market gets regulated, it will open doors for a lot of entrepreneurs which is needed to grow this space we all love. 9.Blockchain foam has been usually seen recently as it has been over-speculated. It is estimated, blockchain will have been unstable, speculative and abusive. What is the craziest idea have you ever heard? It is still a very young market. We believe we will see a few more bull and bear markets before it stabilizes. I have seen a few crazy idea's, one of them was an Uber type app for drone taxi's. Not only is the technology not ready to have flying cars, the amount of regulatory changes, air control traffic, infrastructure changes you will have to go through before you can launch an actual working product are insane. 10.According to your experience, are there any mature profit model or business model. For individual investors, from which dimension should they evaluate a project? I cannot give investment advice or general guide lines for it. Simply do your own research or find parties who do this research for you. 11.SEC has not approved the application of bitcoin ETF. In your opinions, when bitcoin ETF will be approved or it won’t be approved? Why? I think that the derivatives are already a step in the right direction. Most likely some regulatory changes need to be implemented before the SEC will approve ETF's, what these changes exactly need to be I can't speculate on. 12.Some people believe that bitcoin is anchoring currency like gold. May I have your opinion about the value of bitcoin? Can bitcoin keep rising? I also believe Bitcoin found a good use case as a "store of value", like gold. I strongly believe cryptocurrency and blockchain will be mass adopted in the future, so my opinion is highly biased. With that being said, yes I believe Bitcoin will become much more value as it is today. I think once we hit the previous high, we will quickly surge to $100k per Bitcoin. 13.ICO is illegal in countries like China, can the policy in these countries affect AirdropAlert? We have a worldwide reach with visitors of 200 countries. China is a big country, but the users we get from China are limited. So right now it does not affect us. For clients who conduct airdrops through us we offer to GEO block regions with strict regulations, so our clients are also not affected. Technology does not encourage these things. Humans have the need for these things, and they find way's to do it. All of these things excised way before blockchain and will exist 1000 years from now as well. 15.We appreciate it that you can participate in the interview. Do you have anything else to share with our Chinese audience?